The Chineke! 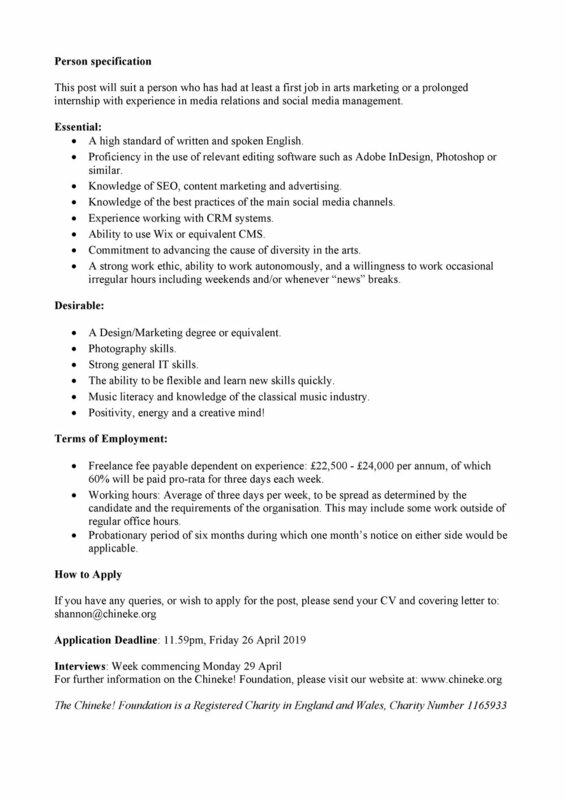 Foundation is seeking a committed, self-motivated and imaginative Marketing & PR Officer to deliver Chineke!’s Communications Strategy recently completed by Four Communications and adopted by the Chineke! board. A copy of the Communications Strategy is available on request for those interested in applying. Reporting to Chineke!’s Artistic & Executive Director and General Manager and working as a part of our small, dynamic team of management staff, Chineke!’s Marketing and PR Officer will play a vital role in the promotion of a variety of projects including concerts by the Chineke! Orchestra, Chineke! Ensemble and Chineke! Junior Orchestra, and our Learning & Participation programme, attending rehearsals, concerts and other projects in order to document and promote them. You will lead the expansion of the organisation’s online presence including managing the organisation’s website and social media accounts. You will also run Chineke!’s “Friends” programme, producing a quarterly Newsletter and providing a high level of customer service to our donors.